Who doesn’t love a super simple activity that can be played over and over again? 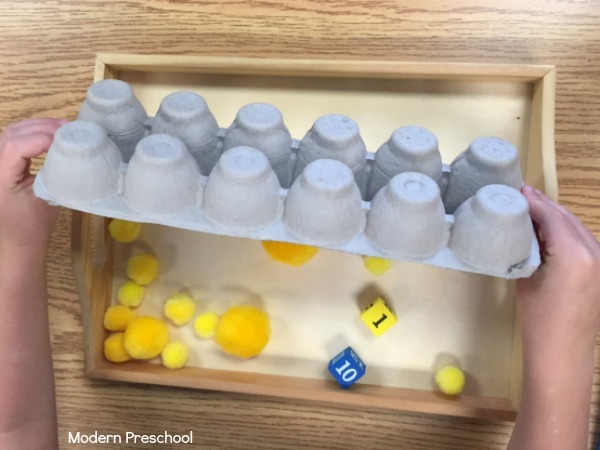 Simple activities are perfect for my preschoolers in my classroom. And I love when I am able to sneak in learning skills without taking any of the fun away. To go along with our bug theme in preschool, we focused on bees for a while. Our bee pollen counting activity was a hit in my classroom while we practiced math and number skills! Once you collect all of your supplies, you are just about ready to play! Yes, it’s that simple! I use individual trays in my classroom for a lot of our table top activities. This keeps all of the materials together and also gives my preschoolers an area that is just for them to play in. 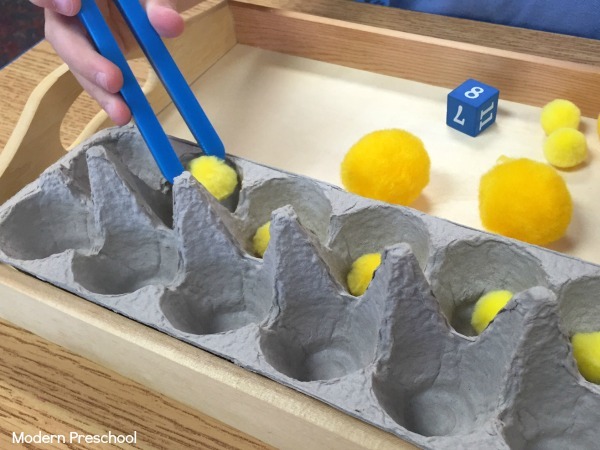 Each egg carton bottom was placed in the tray, and the yellow pom poms were scattered on the rest of the tray. The egg carton represented the bee hive and the pom poms were our pretend pollen. My preschoolers pretended to bee the worker bees transferring the pollen from the flower back to their hive. 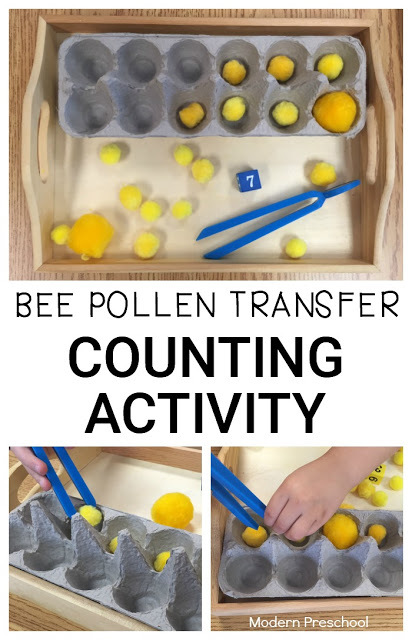 During circle time on the carpet, I introduced the bee pollen counting activity and showed my preschoolers 3 different ways to play. The first way was to simply move the pollen pom poms from the tray to the bee hive with the kid-friendly tweezers. I also showed them how I would roll one of the dice, identify the number, and then count out loud while I moved the correct number of pollen pom poms into the hive. The last option that I modeled for my preschoolers, was to just move the pollen pom poms as I counted. This was a more open ended option to the dice rolling and identifying choice. It also allowed them to count higher than 12, which was the highest number on our blue die. 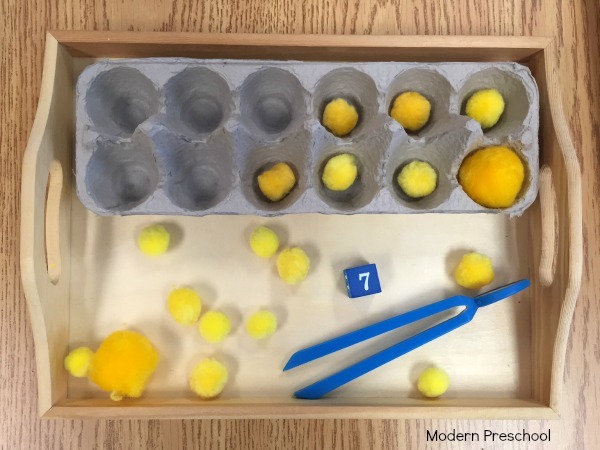 No matter how they chose to play, when the be hive was full, they dumped the pollen pom poms back on to the tray and either played again, or went to another area in the classroom to explore and play!